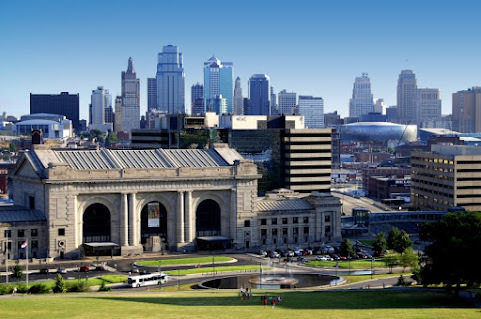 Not so long ago, City Hall purchased and shared this iconic Kansas City image and now we use it as a fair use glimpse of this town and some of the news that's worth a click but might not inspire debate . . . An important overview of crime, crashes and memorials from throughout this town . . .
KANSAS CITY, Mo. - Polling places across Kansas City, Missouri opened at 6 a.m. Tuesday. On the ballot, voters will choose mayoral and city council candidates to advance to June 18's general election. Several school districts have and leadership positions up for vote as well. Motorists needing to take I-49 northbound through Grandview should plan on using an alternate route.All northbound lanes of I-49 are closed due to an incident between Main Street and Harry Truman Drive.Debris has also been reported in the roadway.As of 7:45 a.m. traffic was backed up beyond East 155th Street.This story is developing. A pedestrian is dead after a crash on Interstate 29 just before Barry Road. OLATHE, KS (KCTV) - Olathe police are looking for a suspect in an aggravated robbery that took place Monday. Officers responded to an aggravated robbery call around 3 p.m. to the 700 block of South Keeler Street. A suspect with a gun confronted two people on foot in the area. KANSAS CITY, Mo. - A metro family is grieving following not one but two murders in less than two years. Both cases remain unsolved, and detectives need more information. Penesha Murrell lost two brothers in 18 months. "With us not being able to get over the first one, it was like just a blow in the face," she said. One person was killed Monday in a shooting near 21st Street and Silver Court, according to Kansas City, Kansas, Police Chief Terry Zeigler.The shooting was reported at 9:22 p.m.No other details were immediately available. KMBC has a news crew on the way to the scene. Refresh this page for updates. KANSAS CITY, Mo. -- Family and friends are remembering a construction worker who died earlier this week in downtown Kansas City, Missouri. "He loved each and everyone of them and always made sure they knew that," Christina O'Sullivan said, wife of Dakota O'Sullivan. Dakota made sure Christina knew she was loved the day of the accident. OVERLAND PARK, Kan. - A small memorial now rests near W. 108th Street and Nieman Road in Overland Park. It's where Rowan Padgett and his friends used to spend lots of time. Rowan's friends spent time there Monday remembering their friend. Rowan's family says the young man's life was cut short all because of a gun. RIDGELY, Mo. -- The Platte County Sheriff's Office and Missouri Fire Marshal continue to investigate after the bodies of a young man and toddler were found Sunday burned inside a car. Authorities were called to the car fire Sunday morning on Highway B, just outside the town of Ridgely. Kansas City, MO - Police are searching for a man and a vehicle they believe is connected to the shooting death of a 16-year-old.Clinton Holman Jr. was shot to death around 11:30pm Friday near 43rd and Indiana, according to KCPD detectives. KANSAS CITY, MO (KCTV) - Police are investigating a fatal accident where a car struck a bridge embankment. Kansas City police are investigating a single vehicle accident that has left one man dead. It happened at 7 p.m. Monday near the intersection of 23rd Street and Blue Ridge Boulevard. The death of a man who was discovered dead inside a car Monday morning has been ruled a homicide.